What is a Pulmonary Endarterectomy? Who is a Candidate for Pulmonary Thromboendarterectomy (PTE)? 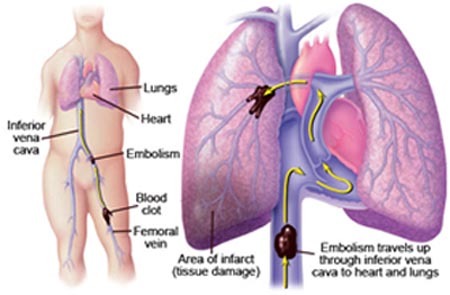 Blood clots from the legs may travel through the heart and lodge in the branches of the vessels of the lungs. Some emboli do not dissolve but become 'organized' with fibrous scar tissue, blocking the vessels in the lungs. Pulmonary Endarterectomy (PEA, also known as PTE) is a surgical operation in which the blood vessels of the lungs are cleared of clot and scar material. Although this sounds simple, it is actually technically very difficult to get access to the arteries of the lungs, and the procedure itself is a major undertaking. For this reason it is necessary to ensure that patients who might potentially benefit from this operation are thoroughly evaluated. Not everyone with CTEPH will be suitable for this operation, and a number of additional investigations must be performed in order to assess the appropriateness of surgery and the level of risk involved. However in a large proportion of patients who undergo this operation, their level of activity, quality of life and life expectancy are significantly improved and pulmonary endarterectomy surgery can be thought of as a cure for most patients. When the diagnosis of thromboembolic pulmonary hypertension has been firmly established, the decision for PTE is based on the severity of symptoms and the general condition of the patient. To prevent progressive right ventricular dysfunction or retrograde extension of the obstruction, which might result in further cardiorespiratory deterioration or death, and to prevent secondary arteriopathic changes in the remaining patent vessels. The prevention of secondary arteriopathic changes is an important indication for surgery. PTE is the surgical procedure to remove life-threatening blood clots—emboli—from pulmonary arteries to restore blood flow to the lungs. 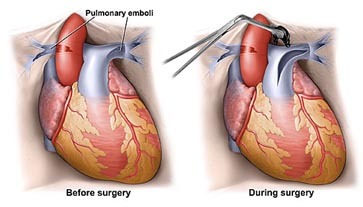 The surgery can provide a cure for pulmonary hypertension due to chronic pulmonary thromboembolic disease by restoring normal blood pressure in the pulmonary artery and removing the chance of right-heart failure. PTE is an eight-hour procedure, performed under general anesthesia, in which the chest is opened and the patient is attached to a heart-lung bypass machine. The patient’s body is also cooled to about 68 degrees Fahrenheit, because this temperature reduces the body's need for oxygen by 95 percent. 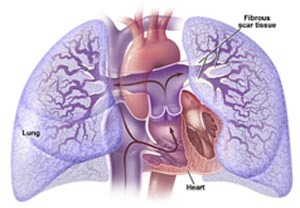 Blood clots can be removed directly from the pulmonary arteries by open-heart surgery. Once the patient is attached to the heart-lung bypass pump and the body is cooled, the surgeons open the arteries obstructed by the clots. The doctors then turn off the heart-lung bypass pump to achieve a bloodless surgical field. While no blood is being pumped through the arteries, the doctors carefully extract the clots adhered to the arterial walls. The clots—often more than 10 inches long—are loosened and removed slowly, one by one. The on-off process of the heart-lung bypass pump is repeated until all of the clots are pulled out. Then, the arteries are sewn closed, blood is allowed to flow back through them, the chest is sewn closed, and the surgery is complete.